5 Ways to Spend Valentines Day with Your Dog! It’s that time of year again! If you’re a flea, you’re probably jumping for joy right now. With winter over, the hot weather is perfect for those pesky flea fest! Aside from the often intense irritable itching from flea bites, it can also lead to severe allergies and disease. Americans spend millions of dollars on flea collars, sprays, and topical solutions every years, unaware of how dangerous these products can actually be. These conventional products can have a numerous harmful effects to you, your family, and furry friends. The “spot-on” flea-control products have grown to be super popular. Topical treatments contain active ingredients such as Pyrethrins, Imidacloprid, and Arylheterocycles. The chemicals act as pesticides and target the nervous system of insects, causing repetitive nerve firings. Labels may warn not to get these substances on your skin, to wash your hands after applying them, and to keep them away from children, yet these chemicals are absorbed by your animal’s skin. Serious medical reactions can include vomiting, diarrhea, respiratory problems, brain damage, heart attacks, and violent seizures. Fortunately, there are much safer and effective solutions that will help protect you and your furry friends! 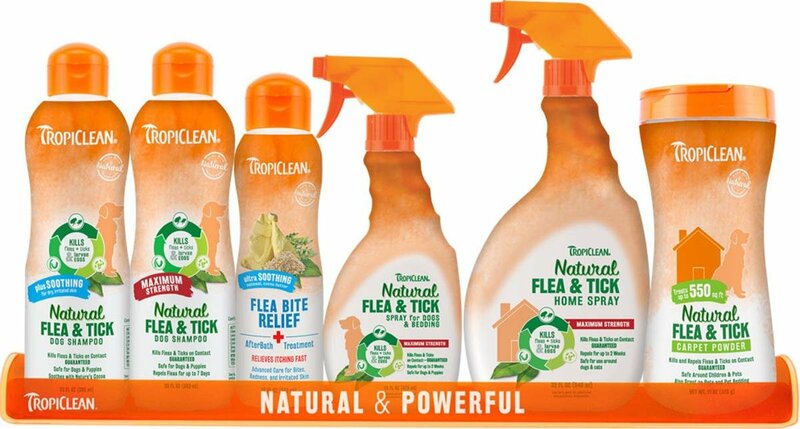 Tropiclean has a new line of natural flea & tick shampoos and sprays, using some of nature’s most powerful pest fighting ingredients such as clove, lemongrass, cinnamon, and sesame seed oil. Tropiclean natural Flea and Tick Shampoo kills fleas, ticks, and mosquitoes by contact and repels fleas for up to 7 days. It’s powerful and effective enough for routine pet baths on dogs and puppies 12 weeks or older. With ingredients including cedar oil, lemongrass, and sesame, Wondercide treats nature with nature. Wondercide’s aroma-therapeutic formula kills & repels fleas, ticks, and mosquitoes and is both a preventative and treatment for use on dogs, cats & home interiors. The spray kills pests like fleas and ticks by contact and prevents them from hitching a ride on your pet when you go on walks or to the park. It kills the insect life cycle: egg, larvae, and adults. Great for dogs and cats! There is no need to buy multiple products for dogs and cats of different sizes and breeds. Take the next step in natural flea control by removing the flea lifecycle from your home and yard. Many people do this by using flea bombs or calling the pest control company. Tropiclean & Wondercide have a natural flea & tick spray for your home and yard. Pests come from outside, so treating outdoors is critical to stopping flea, tick and lifecycle. Start at home and spray top to bottom, including pet beds, mats, and other areas that may be infested.